3-room apartment on 1st floor. Partly with sloping ceilings, comfortable and cosy furnishings: entrance hall. 1 room with 1 bed, 1 double bed, hand-basin and TV (flat screen). Exit to the balcony. 1 room with 1 double bed and 1 pull-out bed (1 pers. ), TV. Exit to the balcony. Kitchen-/living room (oven, dishwasher, 2 ceramic glass hob hotplates) with dining nook, TV and radio. Shower, sep. WC. Balcony furniture. Side view of the mountains and the countryside. Facilities: Internet (WiFi, free). Please note: suitable for families. Non-smokers only. The valley station Planai can be reached in a 10-minute walk. 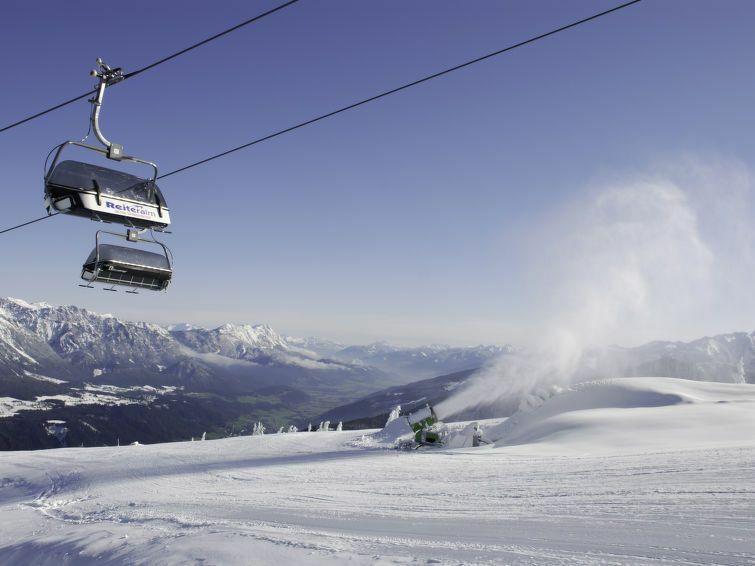 Depending on availability, the owner rents heated ski depots for your sports equipment (4-5 persons). Prices according to notice posted on site. Schladming: Cosy, simple small apartment house Tratter. 800 m from the centre, in a central position, 600 m from the skiing area, directly by the river, in a cul-de-sac. In the house: WiFi. Bread roll service. Parking (for 2 cars) on the premises. Supermarket 500 m, restaurant 300 m, pedestrian zone 800 m, 10 minute walk to the centre, railway station Schladming 1.5 km, outdoor swimming pool, indoor swimming pool 200 m. Golf course 10 km, tennis 500 m, gondola lift, skisport facilities 600 m. Well-known ski regions can easily be reached: Planai, Hochwurzen, Hauser Kaibling 600 m. Please note: the owner lives in the same residence.